You might also want to check out Christian Iconography: The Basics. This is one of a set of frescoes, one in each cell in the friary, depicting scenes from the life of Christ and the Blessed Virgin painted in the early 15th century. The cells are tiny little rooms, where a Dominican friar would retire for solitude and sleep. Fra Angelico’s frescoes were meant as aides to the friar’s meditations, so a Dominican is depicted as an observer in each image. It would be interesting to know how, over the years, the various friars were assigned to each cell, as some cells have cheery images like this Annunciation, while others depict scenes from Christ’s agony – was it random? Did the prior decide that Brother Matthew needed to spend some time praying over the Disposition of Christ’s Body, and so he was assigned that cell, while Brother John needed to lighten up, so he got the Nativity? This Annunciation is in Cell 3. From an iconographic perspective, it is highly conventional, with one exception which we’ll get to in a moment. Mary is kneeling in a room – it is traditional to show her as having been interrupted by the angel while in prayer or study – she’s shown holding a small book in her right hand. She is, of course, portrayed in a submissive posture, saying with her body “behold the handmaid of the Lord. Be it done unto me according to thy word.” Yet the angel Gabriel is also shown in a deferential pose, with head bowed and arms crossed – he may be a messenger from God, but she is God’s Mother. The cross-vaulted cell depicted in the image was dictated by the architecture of the actual cell in which the painting is located – it extends the physical space into the picture, with the curve at the top of the fresco defined by the physical ceiling line. One slightly odd bit in the design is the blank space in the middle – the center of the picture is a blank wall. Usually, you’d expect to see the central person of the image in the center. 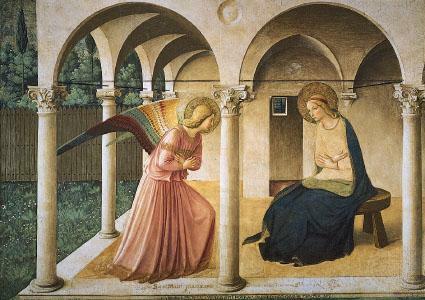 Fra Angelico does this fairly often in his cell frescoes and elsewhere – it seems that, in cases where rank is not clear or where Christ is not depicted, the center is often left blank. Here, it also seems to serve the purpose of the fresco – less didactic, more realistic, so that the brother can better imagine himself there. Here, Fra Angelico is not constrained by the architecture of the cell – but he still makes the odd choice of putting a pillar in the center of the image. You’d think he’d have just move the camera in, as it were, move the figures back a corresponding amount, and avoid the whole ‘what’s holding that loggia up, anyway?’ issue entirely. I can’t remember how this looks in person, I don’t remember it as having struck me as looking as odd as it does here. Fra Angelico was nothing if not careful, and definitely executed his works with a physical place in mind, so, perhaps the columns work better at the top of that actual staircase. 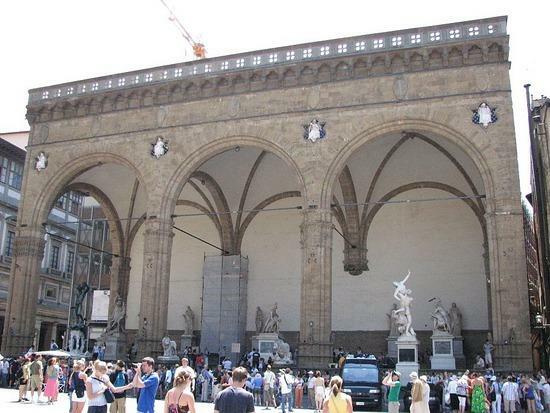 …right across from the Palazzo Vecchio on the Piazza della Signoria, a few blocks from San Marco. The weather is nice in Tuscany almost year-around. Open structures like this take advantage of it. Mary is seated in this image, not kneeling, and she does not hold her book. In the center background, there’s a doorway leading to the interior of the building. Mary has come out, like any good Tuscan, to enjoy a pretty day. Otherwise her and the angel Gabriel’s posture and attitude are very similar to the Cell 3. The main difference is Mary’s clothing. In this second Annunciation, she is wearing one of the two common iconographical options for the Mother of God – a white dress with gold trim under a midnight blue cloak. (The other option: a red gown under a midnight blue cloak.) White is for purity, gold for royalty, while the night sky contains and hides the earth and all that is within it – Mary’s humility and humanity cover and protect that which makes her royal and pure – the God made flesh. Traditionally, red was a masculine, powerful, and obvious color, while blue, especially midnight blue, was feminine, protecting and subtle.The meaning behind this beautiful image would have been crystal clear to 15th century Italians, and, indeed, to Christians everywhere up until modern times. 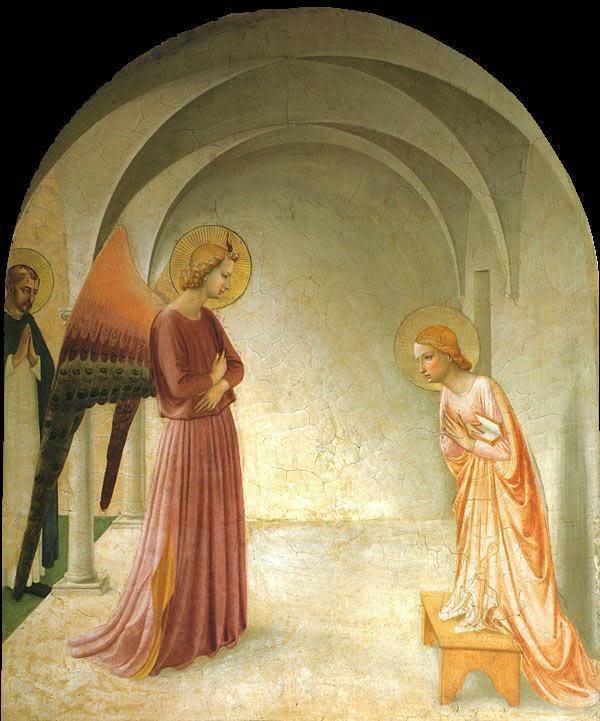 In cell 3, however, Mary wears a simple reddish-gold gown, which is far less common in traditional images. There are three reasons: first, in general, the cell frescoes used simpler (and cheaper!) colors, which eliminates gold leaf, for starters; second, Mary is in doors, and so wouldn’t be wearing a cloak; and third, the Dominican friar lurking in the background left is supposed to be inviting the living, breathing Dominican friar kneeling before this image into the scene – he is to see Mary for what she truly is – the Mother of God. Her true self is not shielded from the faithful in humble prayer. I had seen the second painting, but had no idea it was part of a set, nor that it was “set” at the Friary. (I think the painting in my avatar is set at the same place.) Fascinating. Thanks! Glad you enjoyed it. San Marco is not as famous as many places in Florence, but very much worth it, especially for the Catholic and holy nature of the place.